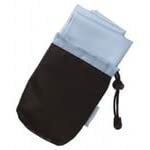 Travel towels or microfibre towels as they are often know are ideal for campers and travellers as they are thinner than regular towels and therefore take up less space in your bag or suitcase. Despite being lighter and thinner than a regular towel they are more efficient at drying and come coated in an anti-bacterial treatment. Some travel towels are six times lighter and dry four times quicker than a beach towel. They are also able to absorb eight times their own weight in water. This means your travel towel will be dry in no time at all allowing you to pack it up in your bag without the risk of it going mouldy or smelly like a regular towel would. As they are lighter you can pack more of the things you want to take with you rather than wasting space with a regular towel.